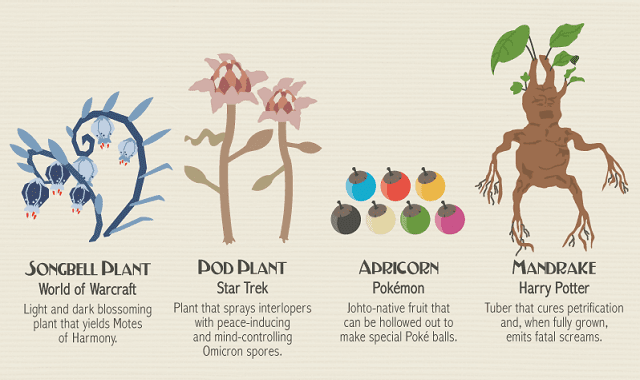 The Garden of Fantasy Flora: 80 Plants from Fiction #infographic ~ Visualistan '+g+"
The best fictional worlds from movies, video games and television shows are the ones that are truly immersive and pull you into the experience. These imagined environments must have unique characters and locales that bring the world to life. On a deeper level, it's the little details that pull you out of reality and plop you happily into a fictive universe. Arguable the most important of which is flora. Flora includes all plants, flowers, trees, bushes, etc. that the world is made up of. Screaming mandrakes from Harry Potter made you believe in the wizarding world you were watching on screen. Nirnroot from the Elder Scrolls video game series made you feel like you were really living in a realistic fantasy world. This infographic, made by the flower delivery company Avasflowers, displays 80 fantastic plants from the most iconic fantasy, science fiction and overall fictional universes this world has ever seen.